All in for her last 35,000 about 45 minutes ago, Loni Harwood has been on a heater ever since. There's about 115,000 already in the pot in action between Harwood and Andreas 'Rayo' Kniep when the dealer puts out the [Jc][8s][3s] flop. Both players get their chips in the middle and the stacks appear to be very close. Kneip has Jack for top set. [Ah] turn changes nothing, but the river is [Ks] for set over set. 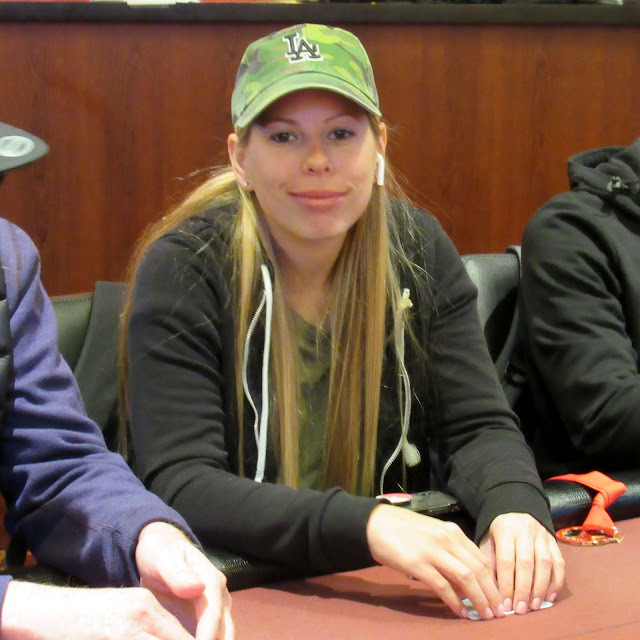 The dealer and a floor confirm the counts - 175,000 for Kniep, 179,000 for Harwood, she has Kniep covered by < 2BB and earns the elimination. From 35,000 to 470,000 and a top-3 stack in the room in less than 45 minutes for Harwood.